The town was a harbour upstream of the mouth of the Arun. In the 1820s rather sporadic efforts to develop a resort along the coast were started and as in other coastal towns only in the late C19 were the two parts united, as the town prospered and also expanded northwards. In the old part is the mediaeval parish church of St Mary, rebuilt in 1824 and again in 1934. A temporary church, St James, was built in the new northern part and was replaced by a permanent one in 1910. Northward expansion in the second half of the C19 also took in Wick, a hamlet in the parish of Lyminster, where a chapel of All Saints was opened in 1881. 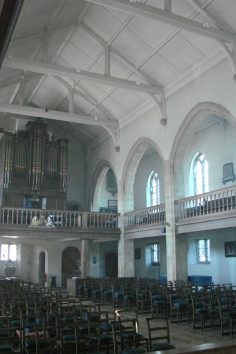 It remained part of Lyminster until 1966, when the chapel became a parish church.